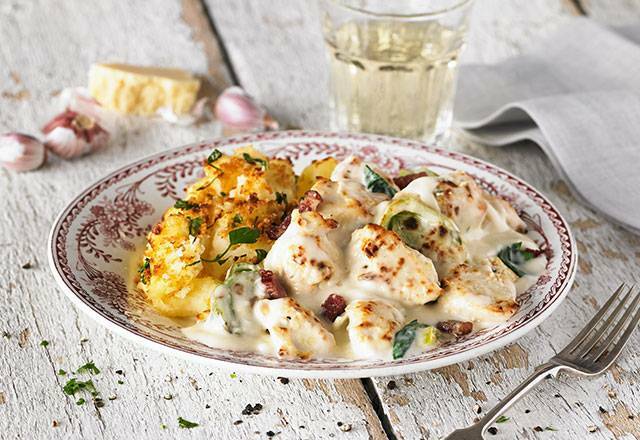 Tender chicken in our creamy sauce with smoked pancetta lardons and a splash of white wine. Served with creamy mashed potatoes. Remove the film but leave the chicken and mash in their wooden trays*. Place both trays on a baking tray in the centre of the oven and cook for 25 minutes. Potatoes (35%), chicken (19%), cream (milk), milk, butter (milk), smoked pancetta lardons (pork, salt, dextrose, glucose, antioxidant sodium ascorbate, preservatives: potassium nitrate and sodium nitrite*, flavourings, garlic powder), white wine, Cheddar cheese (milk), single cream (milk), whipping cream (milk), onions, leeks, Dijon Mustard (mustard seeds, water, vinegar, salt), spinach, golden breadcrumbs (fortified wheat flour (wheat flour, calcium carbonate, iron, niacin, thiamin), yeast, salt, sugar, colours: plain caramel and paprika extract**, turmeric extract, sunflower oil), fortified wheat flour (wheat flour, calcium carbonate, iron, niacin, thiamin), rapeseed oil, parsley, salt, garlic purée, cornflour, black pepper. *Don’t worry, these are part of the traditional curing method of smoked pancetta lardons. **Fear not, these are used to give the breadcrumbs a lovely golden brown colour. To bring out the delicate spring-like flavours of this dish, we recommend pairing with a lovely, light beaujolais.